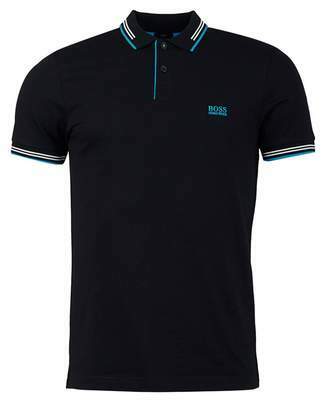 The Paul Short Sleeved Polo by Hugo Boss Green features a stripe tipped contrast collar with a three button placket. A perfect piece to see you through the day. Team up with jeans and trainers for a modern look. 56% cotton 39% polyester 5% elastane Short sleeved Three Button placket Branded buttons Hugo Boss embroidery to left breast Contrast stripe to collar Slim fit Machine wash Size and Fit Size photographed: medium Pit to pit: 19.5"